If you're keeping count, I have something like 12 blogs. Here is number 13, but as a shared blog it's totally going to be AMAZING, am I right? No Award, a blog where Liz and I look at social justice and media from our personal POVs, that is, being Australians of varied backgrounds. In the six days since we launched, Liz has written an overview of the issues with Pacific Rim and a book review of the classic Melbournian SF dystopic novel The Sea and the Summer; and I have written economic and historical treatises on the logistics of Australia and China in the Pacific Rim universe and how their Jaegar programs would be structured. There are so many great blogs in the world, but a lot of them (most of them) are very US-centric. This blog is our attempt to create a media/fandom blog that's focussed on not USA things. I am having a lot of fun with it! In 2012 I lived in Beijing and Melbourne. 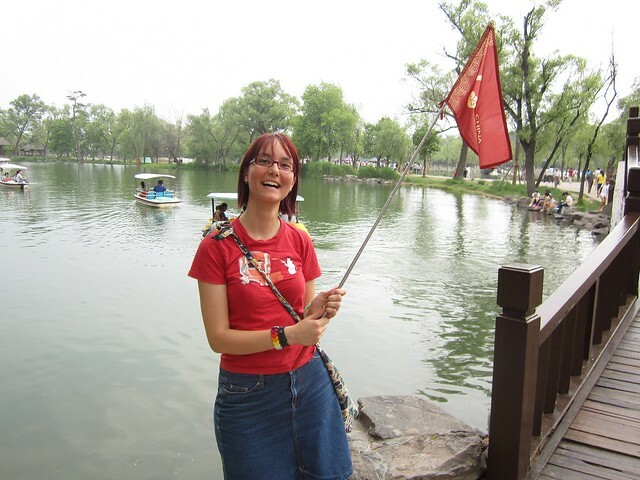 I turned 30 in Beijing, and I was super sad about it until I remembered I TURNED 30 IN BEIJING. My first ever summer birthday! I visited Xi'An and saw the Terracotta Warriors, flew first class and rode an overnight train. I also visited Qufu (where Confucius was from), Ji'nan, and Chengde. And Perth. And Geraldton and Cervantes. I blogged my year at Song of the Travelling Penguin - a post a day; and I took copious pictures and put them in albums on my flickr. Beijing made me super sick. I was deficient in B12 and vitamin D, and my doctor also made me take flaxseed supplements. After I visited Melbourne in February, I also had to take an asthma puffer back to Beijing with me, and I suffered from hayfever for the first time ever. My depression was ups and downs in an impressive fashion, and after I returned to Australia my doctor and I agreed that anti-depressants were a thing I should try. I'm still trying them. I got a new therapist, and I broke up with them. My hair has been red almost all year, and one time it was dyed in China by my hilarious hairdresser who didn't speak any English and thought I was adorable. I learnt how to play Xiangqi, and some weird Uno version played by doctors of my acquaintance. I learnt how to do Chinese watercolour painting, which I love a lot. I got broken up with and it hurt and was sad, but to be honest it was mostly a mutual breaking up. I am having fun being single and rolling around in my large bed by myself with my stuffed toys. I dunno what 2013 will bring. I've been home for a few months now and still don't have a job, though I thought I'd have one by Christmas. I returned to archery and swing dancing, and after months of cycling around Beijing I now cycle around Melbourne, too. This Christmas saw my return to the water, and it was so wonderful, I love it so very much, and I hope to return to lap swimming this week. I got a bass guitar for Christmas, and Danni and I are gonna start a band. A JAZZ-SWING BAND. Yeah, cause we're cool. 2013 will also feature me running a con. Which will be exciting/nervewracking/omg. 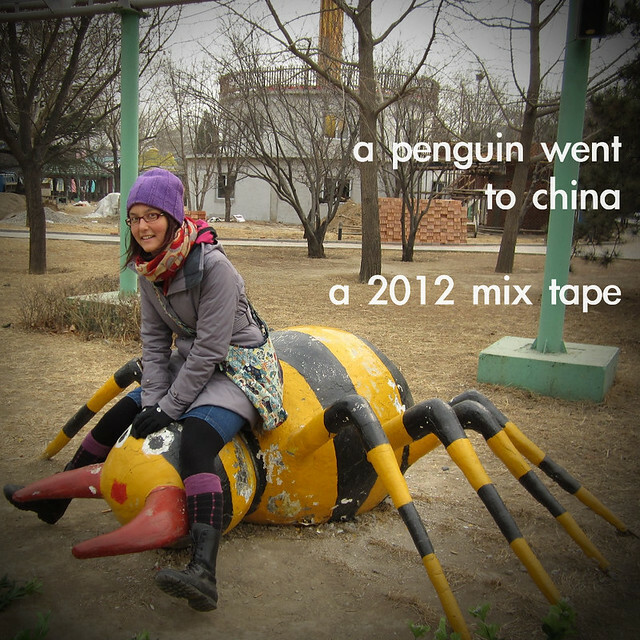 This year a Penguin went to China, and came home and made this mixtape. My love and music to you all. the chronos awards recognise excellence in science fiction, horror and fantasy by victorians. that's victorians the residents of victoria, australia, not victorians from any other time or place. if you have read or seen something awesome by a victorian in 2011, please nominate them! more details on nomination can be found at this post (and you can even nominate there!). 'one last interruption before we begin,' which can be found in steampowered ii: more steampunk lesbian stories, published by torquere books and edited by joselle vanderhoft, and written by stephanie (penguinface) lai, is eligible for nomination! if you haven't read my story and are interested in doing so, let me know and perhaps something can be arranged. My excuse is that I was in the process of moving to China when Steampowered II: More Lesbian Steampunk Stories was released, so it is with much embarrassment that I belatedly say: Steampowered II was launched! It is available for purchase as a print version (book depository, amazon us) or an e-version (torquere, amazon us, amazon uk), and I recommend it for you and all your friends! You should buy it! It features a story by me! One Last Interruption Before We Begin. It is about a Malaysian Chinese port clerk, and features my love letter to a building and a meal, as well as continuing my obsession with world building a steampunk Malaysia. Oreotalpa on goodreads, who comments it feels like a setup for a novel. I am not going to lie, I would love to write a novel in this world. I am so excited that people liked my story, and to be in such an awesome anthology! ALSO, Jha interviewed me as part of the Steampowered II Roundtable! As usual I am very bad at answering questions, but Jha is very good at asking them. You can read my interview at Silver Goggles. And more recently than that, Jha interviewed me as part of her POC-Steampunks series; read the interview and see me babble about Our Colonial Past, being a SEA Steampunk, and steampunk in Australia! In not related to me but related to steampunk news, Ay-Leen the Peacemaker was interviewed about Steampunk Jewellery and it is an awesome interview: you can read it at Decimonic. In it she talks about steampunk, jewellery, and cultural appropriation. 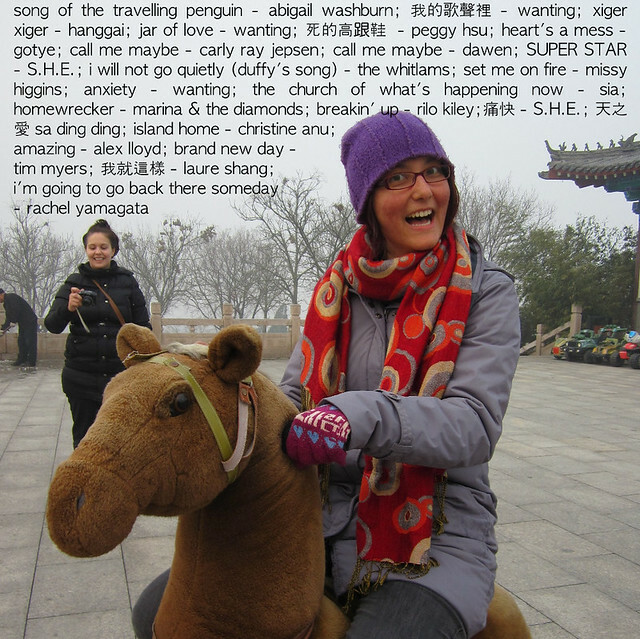 i will still be posting to dw/lj, but you can also find me specifically blogging about adventures in china at song of the travelling penguin. you should be able to syndicate it to your rss reader if you don't like reading tumblr. i'm so nervous and my tummy is all butterflies. three hours until the plane. again, free to a good home. i'm getting rid of some books! all books are free to a good home. or a bad home, though vegan goodies are always gratefully accepted in exchange. if you're in melbourne we can arrange book drop, if you're in australia but not in melbourne you can pay for postage. So, the TOC for Steampowered II: More Lesbian Steampunk Stories, edited by JoSelle Vanderhooft, has been announced, and not only is it full of interesting and exciting lady steampunk but also it has one of my stories in it! EXCITING. I am so incredibly excited to be included in this awesome anthology, along with writers I really love. I am looking forward to reading them all! My story, 'One Last Interruption Before We Begin,' is a bit of a secret love letter to a certain building in Penang, as well as a continuation of my steampunky-Malaysia universe. Also there are ladies. I am also excited about the fact that there are three (3!) Chinese-Malaysian writers included in this anthology. How cool is that? I think I might be the only Australian though (which is cool, too). Anyway, I am looking forward to it, and I hope you are, too! Well internets, here I am in Shanghai! It is humid and the air is thick, and yesterday Ms Mandysbitch found a line of grime around her neck from presumably the pollution. It is actually not too bad, pollution-wise! My Australian-accented Beijing-style Mandarin is going just fine so far! Yesterday we caught a taxi back to our hotel, and whilst I was busy arguing with the taxi driver in Mandarin, she was watching our taxi drive down the middle of the road towards an oncoming bus. I didn't even notice! I had no idea what street we were on! But I did some shouting in Mandarin, so it's all good. Today I also had several conversations in Mandarin! GO TEAM STEPHANIE PENGUIN. 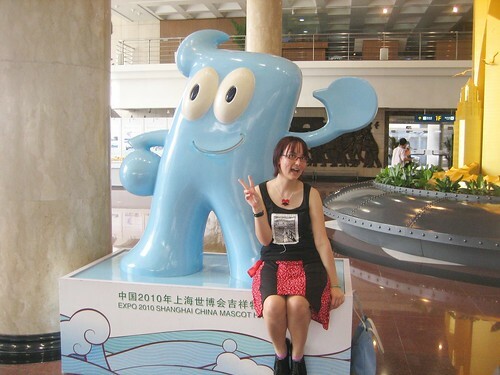 Today we went to the Shanghai Urban Planning Exhibition Centre. You know who is an urban planning nerd? This penguin! So that was awesome. There was a giant model of the entire city in there. It takes up a whole floor! I have discovered an awesome show, 'Love of Seven Fairy Maidens.' I am completely obsessed with their ridiculous costumes and hair pieces and acting, and I hope to find a copy of it to take home. Or to dl. I can't access blogger, which is incredibly frustrating. I set up a whole bunch of posts to post to my vegan blog whilst I'm away, but now I can't log in to moderate comments! So people are going to think I'm ignoring them or censoring them! I'M NOT I PROMISE. More later I guess! I am occasionally uploading photos at my flickr, so you can check there for things! No twitter or fb for me, alas, so no updates there for a while.